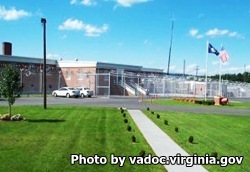 Wise Correctional Unit opened in 1964 and is a level 1 high facility located in Coeburn Virginia. The facility is comprised of two dorms, two special housing units, a kitchen, dining hall, laundry facility, recreational area, classrooms, administration offices, library, commissary, visitation building, a maintenance shop, farm buildings, and five greenhouses. Wise Correctional Unit can house 116 general population inmates and contains four special housing beds. Inmates are allowed free roam of most of the facility during the day. Inmates are employed and work either in Wise Correctional Unit or in one of the nearby facilities. Wise Correctional Unit operates a large farm containing an apple orchard and grows vegetables in greenhouses using hydroponics. The food that is cultivated is used in the facility and excess food is sold to supplement the budget. Inmates can work on the farm and also work with the Department of Transportation on roadways. This facility is rated among inmates and auditors as one of the better places to be incarcerated in. Anyone wishing to visit an inmate at Wise Correctional Unit must have an approved visitors application on file first. Visits occur on Saturdays and Sundays, the exact day and time you are allowed to visit will depend on the current visiting rotation, contact the facility at the telephone number provided for more details.